Once again we gather here at Avila On Hudson to remember Mother Angeline, this time on the 30th Anniversary of her death. Where do three decades go? I was one day short of seven years of priestly ordination, and Bishop Hubbard was approaching the 7th Anniversary of his episcopal ordination when the news went out that the beloved Foundress of the Carmelite Sisters for the Aged and Infirm had been called home to the Lord whom she had served so long and so faithfully. Some here in the chapel were in the Motherhouse that day or in the missions or at home. Others were with their families or going about their business, and some of those present here were only “in the mind of God” when the Venerable passed away. But, it is a testament to her life and to her charism that three decades later we can still gather and thank Almighty God for the gift of her life, the inspiration she provided and leadership she gave, and the lasting memorial of the witness of a holy, Christian life that still moves her Sisters and their lay associates to serve God’s beloved Aged and Infirm with dignity, love and compassion. They say that the proof of a person’s life is in how they die. Well, we can say Venerable Mary Angeline Teresa McCrory lived well, and died well. Over these decades, enthusiasm for and exploration into the life and message of Mother Angeline have not faded. We have studied and reflected upon her life from many different perspectives, highlighting various features of her spirituality and her many virtues. This year we are considering our dear Carmelite Sister as a “Disciple of the Gospel” a timely choice, I believe, as the Church seeks to renew itself under the aspect of a new evangelization – not a new gospel or a new message, but the timeless teaching of Christ who is Himself the Good News presented to our modern world with a new ardor, and using the new methods that will touch the hearts and souls of modern men and women. Anyone who has ever tried to sell anything or convince anybody of anything knows that the human ear can get so tired of hearing the same message that as soon as the sentence begins, the listening stops because the person concludes, “Oh, I already know that, or even, that again?” With all of the mass communication that we have today, it is necessary for the Church to find a means to proclaim the Lord Jesus and His life-giving message and truth in a way that it can be heard, in a manner that can break through all of today’s noise and touch the heart. Christ Himself left the Church the duty of going forth to the whole world to proclaim the gospel to every creature, as we heard today in St. Mark’s gospel. He promised, as well, “to work with the preacher and confirm the word through accompanying signs.” The new evangelization, though, does not just mean going off to faraway places with strange melodies to proclaim the gospel to those who have never heard it. New evangelization also implies going to our neighbors and associates and strangers who may have grown cool in their faith, and to give witness to Christ and His message in such a way as to rekindle faith and hope in their hearts, through the power of the Holy Spirit. You know, Mother Angeline was heard, wasn’t she? 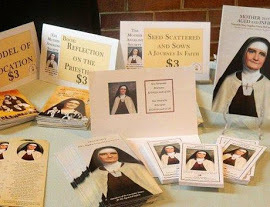 She could persuade people – young women to take up the Carmelite vocation, bishops and priests and benefactors to help in establishing and maintaining beautiful homes for the elderly, doctors and volunteers to share in the work. She knew how to communicate effectively, politely and convincingly. She had great faith, and a great sense of people. She understood what could move hearts, and she was practical and real. But, Mother Angeline wasn’t selling anything. While she was good at going door to door on the quest for money and food for the elderly, she was not a door to door salesman, salesperson. She was a disciple of the Lord. Her motivation, her drive, her principles all came from faith and from a faith placed firmly in Christ, a faith nourished by prayer, by the sacraments and by the gospel principles according to which she was raised in her family and within the Church and in the formation she received in the Little Sisters of the Poor and in Carmel. We can say that Mother Angeline could be heard, because what she spoke and wrote and witnessed to was always true, and the human heart is created to hear and receive the truth who is Christ. St. Paul wrote, “No one who believes in Him will be put to shame.” What Mother Angeline Teresa said was believable because she was believable. The determination that marked the life of Venerable Mary Angeline Teresa even in the moments of difficulty, came from her having heard the word of Christ that was preached, and believing in that word with all her heart. Mother Angeline honored and valued priests so much because they brought her the word and the sacraments and even if they weren’t perfect themselves, the One that they preached and ministered was perfect, Jesus, Her Spouse. We are familiar with the expression of Mother Angeline’s that the spiritual reading that she loved the best was the gospels. For a well-read woman such as her, that is telling. But, it was a characteristic of Mother Angeline to be an opening and listening person. She was eager to learn, and she passed that on to her Sisters. She emphasized retreats, days of recollection, study, good homilists and homilies and retreat masters, and emphasized the importance of silence to provide time to absorb and reflect. She wanted her sisters to learn about music and liturgy, and to keep up-to-date on the best modern means to care for the elderly. Like Isaiah, she wanted her Carmelite Sisters to climb the Holy Mountain, not Zion, but Christ, “that they may be instructed in His ways and walk in His paths” and to want instruction in good and holy things. That is because she herself was a disciple. Now, the New Testament distinguishes between the various groups of disciples, as we know, as well as the twelve apostles. To be an apostle means to be a messenger, one who is sent, as the twelve apostles were formed and sent out by Christ to preach the Good News, really, to bring Himself to others in words and by witness. But the word disciple goes to being, to who we are and how we face the world. Our word for disciple comes from the Latin word discipulus from which we get the English word pupil, or student. Beneath that, is another Latin word discere which means to learn. So, a disciple is, really a life-long learner in the school of Christ. If we keep that attitude, that we can be like Mother Angeline who stayed fresh and open to learn, while never forgetting the foundational principles on which her life rested – the gospel, the teachings of the Church, the standards of religious life, and good human common sense. For each of us, our formation in Christ is never ended and Mother Angeline was always in formation. There is always something more for us to learn about Our Lord, His love, mercy, will and plan for us. There is always something more for us to learn about others – and about the mystery of ourselves – and how to be compassionate, loving and forgiving. There is always something more for us to learn about how things are, and how we should face problems and challenges because we are always changing, growing and aging, and there will always be something new for us to stare into. When can see too, in the way the Venerable organized her ministry to the Aged how each principle of care rests on a gospel value: love, especially for the poor, hospitality, justice, dignity and compassion. If we remain, like Mother Angeline, as a pupil, a learner, and sit at the feet of Christ and let His wisdom and healing flow into us, then we will have lived as Disciples of the Gospel as well, people who are happy and at peace, because the Word, the Gospel are not a just a series of sentences and phrases and stories in the bible, but the real, living presence of Jesus Christ the Light of the World with whom we are in relationship. The Christian life is an evangelical life, a gospel-based life and holiness lies in having lived that life as far as we can, to the full with God’s merciful help. As we reflect again on the life and charism of Mother Angeline we can detect not only that she lived the gospel life, a life of faith in Jesus Christ to the full, but that she had a certain way of doing that as a pupil. Let us all go back to school, the school of Christ, and with Venerable Mary Angeline, learn each day from Our Lord, from His word and message, and allow Him to teach us deeply within our hearts the loving will of the Father for us. 30th Anniversary of the Death of Venerable Mary Angeline Teresa, O.Carm.